Relievers, and their usage, have been at the forefront of nearly every playoff conversation this year. Many articles have been written about Andrew Miller. He’s entered games in the fifth, he’s pitched multiple innings every time out, and he is the best reliever on his team. Kenley Jansen has come in during the seventh, didn’t close out the game, and his team won in nine innings. Aroldis Chapman has come in multiple times with runners on base in high-leverage situations. This type of use has been called for in some corners for quite some time, and it would be nice to think some sort of a trend has started that will carry over to future years. Don’t hold your breath. Two years ago, Kansas City used a collection of mediocre starters and a knockout bullpen to advance to the World Series and it seemed, at the time, that thoughts were changing about relievers. And that might have been the right reaction. It wasn’t just necessary to have a good closer. To shorten the game, great relievers could be used in the seventh and eighth innings to make up for a lack of starting pitching. With starting pitchers generally earning greater annual wages (and deservedly so), teams could more easily acquire relievers. And teams proceeded to do so: after a total of 21 free-agent relievers signed multi-year contracts in the four seasons prior to the Royals’ first run to the Series, 17 similar contracts have been signed in the last two years alone, per the Transaction Tracker at MLB Trade Rumors. Teams weren’t just paying for saves, either. The list of players and a few relevant stats from the two years before signing are listed below. There isn’t a big relationship here between saves and the contracts the players received. Darren O’Day and Andrew Miller, despite having little experience as a closers, signed big contracts. And while other pitchers — like John Axford, Jason Motte, Francisco Rodriguez, and Sergio Romo — might have received some extra consideration due to their role as closers, many players received multi-year deals without having ever held such a role. That doesn’t mean teams were paying directly for talent. The chart below takes the pitcher’s two-year averages for WAR (which incorporates FIP) and RA9-WAR (which uses runs allowed), and then takes the annual salaries of the closers (20 saves or more) and non-closers to see how much teams were paying per win. An average of the prior two years isn’t necessarily a perfect representation of the performance for which teams are paying, but it should provide some sense of the evaluative process. Teams are paying more for closers based on a FIP-based WAR, which isn’t necessarily a wise decision. However, teams are paying the exact same amount per RA9-WAR. While there are better ways to value players, it appears teams care less about saves and more about runs allowed. That’s progress — and some indication that the Royals’ run made a difference. This doesn’t necessarily mean that the bullpen usage we’ve seen during the playoffs will carry over to the 2017 season. One part of the changed 2016 postseason, the multi-inning reliever, simply isn’t as feasible during the regular season. Andrew Miller’s 11.2 innings during this postseason over eight Cleveland games projects to 236 innings in a 162-game season. Kenley Jansen is on a 156-inning pace. Roberto Osuna was on pace for 182 innings and even Chapman is on a 108-inning pace. Extra off days and the lack of concern over a pitcher’s performance next month make multiple innings possible now but unrealistic in the regular season. While the emergence of more multiple-inning appearances by relievers is something that could be better utilized in baseball, the multiple-inning destroyer in the Andrew Miller mode might not represent the best use of resources during the long regular season, where there’s also some advantage to deploying him in the highest-leverage moments possible. It’s that last part that’s most intriguing for the future. Seeing Andrew Miller and Kenley Jansen enter games at earlier moments than traditional usage would dictate — when there’s no realistic chance of a save and the leverage is highest — is what’s most appealing. While free agency might not be paying for saves if the above trends hold true, that isn’t the same down the service-time line. Andrew Miller signed his four-year, $36 million contract already. There’s little reason for him to complain about when he is used. He will get paid all the same. That isn’t true in arbitration. Last offseason, 37 relievers who pitched at least 80 innings over the previous two seasons went through the arbitration process. Arbitration, of course, is a process that rewards past performance. Arbitration salaries differ based on service time, but using the 25/40/60 method from Point of Pittsburgh, we can put all the salaries on the same footing. 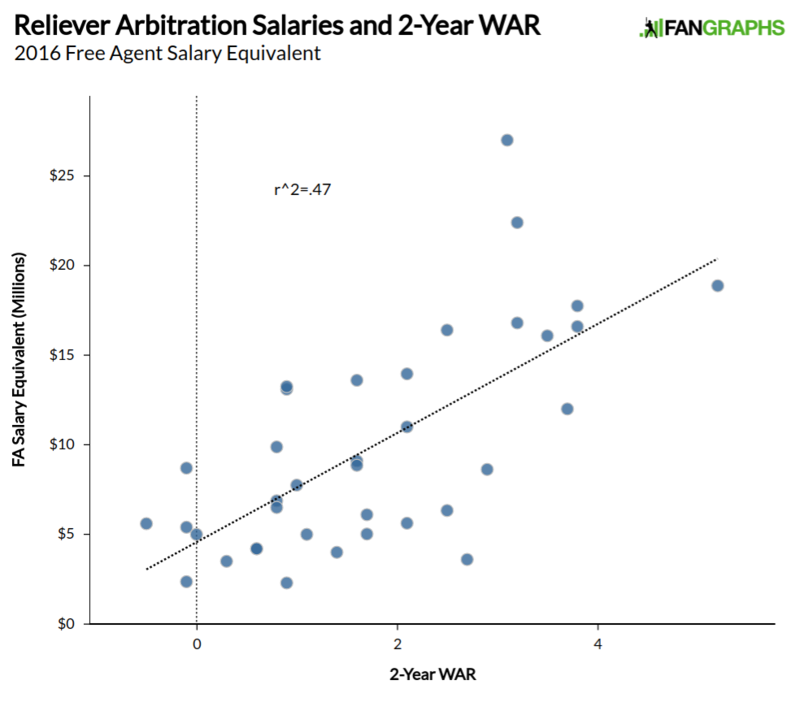 Below is a scatter plot of the arbitration salary equivalent and WAR from the previous two seasons. That’s a pretty strong correlation — and a good indicator that young relievers are getting paid based on performance. Given what we saw above with free agency, it shouldn’t come as a surprise that RA9-WAR has a slightly higher correlation. Saves, however, blow them both out of the water. Teams and management pay attention to it. On one end of the spectrum, Mike Matheny factors it into game decisions. On the other, teams might keep better young relievers from closer jobs, instead handing that responsibility to a proven closer. That likely factored into the Oakland Athletics decision to give Sean Doolittle a contract extension, and possibly that same club’s decision to hand Ryan Madson a three-year deal. That isn’t necessarily a new trend, but those situations still put a reliever as end-of-game closer or middle-inning fireman, not the hybrid who both finishes off close games while also sometimes pitching earlier should the need arise. The best relief pitcher should still end up pitching the ninth in a lot of cases because that’s when many of the highest-leverage appearances take place. The comfort both for players and managers in their roles might be one reason we won’t see a greater number of elite relievers in high-leverage situations early in games. We might see some relievers, already secure in their contract status, accept roles that involve innings other than the ninth. How Kenley Jansen, Aroldis Chapman (who has stated his preference for a one-inning role), and Mark Melancon choose destinations and how they are used next year will be good test cases next year to see how much the thought process behind closer usage has changed. Andrew Miller might just be a very unique case. 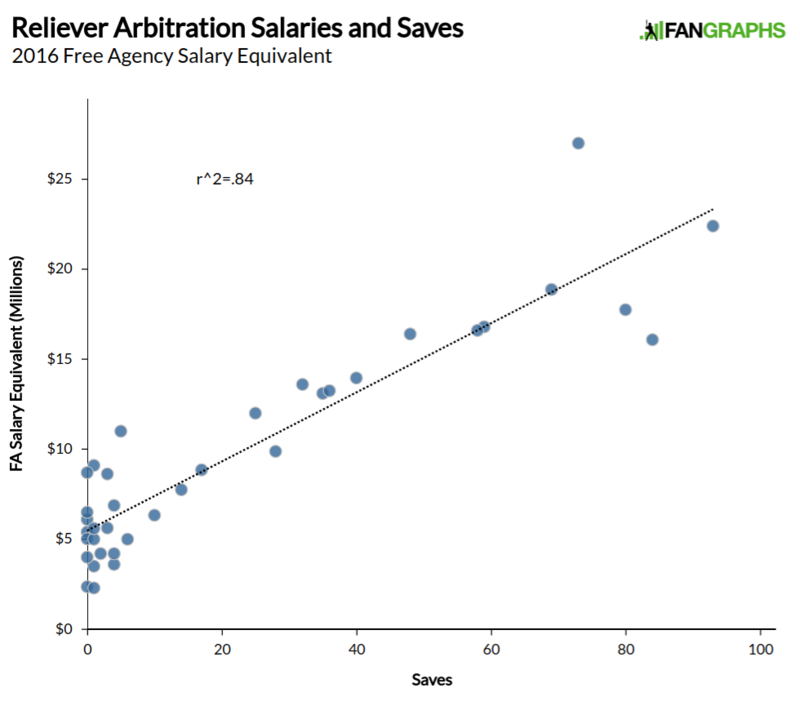 There could be some changes over time, and some of those changes have already been in motion for several years due to potentially suppressing arbitration salaries, but it is hard to see an imminent revolution in bullpen use in today’s game. We hoped you liked reading Despite Postseason, Bullpen Revolution Not Imminent by Craig Edwards! I can see teams using their reliever as a “fireman” as Brian Kelly has talked about, but in terms of having a pitching staff of just relievers I don’t see it happening. I don’t think the Comissioner and his committee will allow it for very long, all it takes is one team doing it for one season or even less and they will develop rules to put a stop to it, they are already worrying about offense as it is. I can’t fathom the commissioner needing to step in. What does that rule look like? Realize that there are only a few players playing the role of stopper effectively and they can’t pitch every day. I think that if a team attempted to go all RP, they would end up with a bunch of awful pitchers pitching a lot of innings. This “trick” only works in a short series with a ton of rest where you don’t really care much about the health of your pitchers. I do not believe that RP is the evolution of the game – it is just a trick for a high-stakes short series at the end of the year. Please provide the details of how you’d pencil out this hypothetical “all reliever pitching staff” to get to the 1,400+ innings that an MLB team needs for a 162 game season. The MLB-AAA shuttle can help, but the details limit that help. A player only has 3 option years, and then needs to clear waivers to be sent down. Also, any player with 5 years of MLB service time needs to consent to an assignment to the minors (regardless of options and waivers). So a team can’t just put any pitcher on the MLB-AAA shuttle. The eligible pool is limited. Another important detail is that any player optioned to the minors needs to stay there at least 10 days before being recalled. Those are long enough stints to cut into the expected MLB innings that a team could get out of these pitchers, because a player can’t just be sent down for a couple days of rest and brought right back up. A 10 day stint in the minors is also long enough that a pitcher is going to need to pitch at least some competitive innings there to stay sharp, another factor in expected full season workload.